LAS VEGAS — Neustar and J.D. Power will announce a partnership Tuesday at J.D. Power’s Automotive Marketing Roundtable. Neustar has had long-standing relationships with automotive clients and has invested heavily in providing advertisers with audiences that are based on the behaviors, psychographics and demographics of real people to increase digital advertising relevance. The partnership with J.D. Power, an industry-recognized expert in automotive, will offer the first-ever automotive audiences powered by near real-time transaction data. It will combine J.D. Power’s PIN data (lease data, incentive buyers, cash buyers, down-payment, make, model, series data) and Neustar’s identity mapping capabilities – taking PIN data and matching it to the household level. It will give advertisers best-in-class actionable audiences for targeting across offline and online channels, including mobile, OTT and addressable TV, says Julie Fleischer, vice president of product marketing at Neustar. 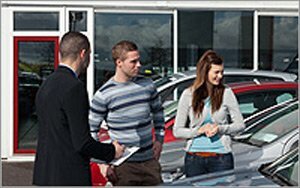 Through the partnership advertisers will have access to unique automotive segments including incentive buyers -- who bought a car based on a rebate or incentive from a car dealership; lease owners -- who signed a lease and when is the lease expiration; finance method -- cash payment, down payment, credit and decision makers, who buy the car on behalf of another person. 2 comments about "Neustar, J.D. Power Partner For Data Tracking". Doc Searls from ProjectVRM, October 24, 2017 at 11:21 a.m.
Can you imagine a car ad that features the "digital advertising relevance" people want because their "behaviors, psychographics and demographics" are being tracked? The simple fact is that nobody buys a car to be in the "audience" for anything, least of all when they are in a "microsegment" of one. They buy cars to drive and ride. Want to know why 1.7 billion people now block ads on their digital devces? Because of crap like this. By the way, the E.U. has made this kind of thing pretty much illegal, with potentially huge fines for privacy violations, starting next May 25. And U.S. companies can be fined if infractions are against European citizens, no matter where they are, inncluding in U.S. cars. Stay tuned for more on that. The news will only get more dire for deals like this one. john Philpin from People-First, October 24, 2017 at 2:25 p.m.
What Doc said ... when is enough enough? Filing under the just because you could does NOT mean you should ... the data that these companies have stolen from me is not theirs - it is mine. Not even a 'is this all right by you?' request, not even an assumptive close - no - they are just going to do it. Assumptive - Arrogant and Aggresive. I hope they learn some lessons from the publishing industry before their company's collapse.